Iran scored a late penalty, given after another video review, and almost snatched a winner in stoppage time which would have seen them not only go through at Portugal’s expense but also top the group, with Spain held to a 2-2 draw by Morocco. The controversy began with the award of Portugal’s penalty, which was saved by Iran goalkeeper Ali Beiranvand, diving to his left to deny Ronaldo. The Real Madrid striker had gone down under the challenge of Iran’s Saeid Ezatolahi and, after originally waving away appeals, Enrique Caceres rightly reversed his decision and awarded the spot-kick after checking VAR. But perhaps the most controversial decision came in second-half stoppage time and resulted in Iran’s penalty. BBC pundit Alan Shearer described the decision to award Iran’s late penalty as “shambolic”. “How on earth can he think that is a penalty?” the former England captain added. “If he thinks it is deliberate handball, he is crazy. Iran’s Portuguese manager Carlos Queiroz, who managed his country at the 2010 World Cup, suggested the referee chose not to send off Ronaldo because of the forward’s high profile. “In the rules, an elbow is a red card, it doesn’t matter if it’s Lionel Messi or Ronaldo,” he said. “I wasn’t concerned,” he said. “It seemed like a normal thing in the match and the referee did what he had to do. But the game’s first goal came with a piece of magic from the boot of former Chelsea loanee Quaresma in the 45th minute. Queiroz had to be spoken to by the referee both for encroaching on the pitch and for his complaints at the referee’s decisions. Even after Karim Ansarifard had scored Iran’s controversial penalty, winger Mehdi Taremi could have won the game with a chance in the fourth minute of stoppage time, but he hit the side-netting with his effort from inside the penalty box. Iran have been eliminated from the group stage at the World Cup in all five tournaments they’ve competed in (1978, 1998, 2006, 2014 and 2018). Both of Iran’s goals at the 2018 World Cup were scored in injury time (94:06 against Morocco, 92:48 against Portugal). Two of the three penalties Ronaldo has taken at World Cups for Portugal have been against Iran – he scored in 2006 but saw his effort saved in this game. 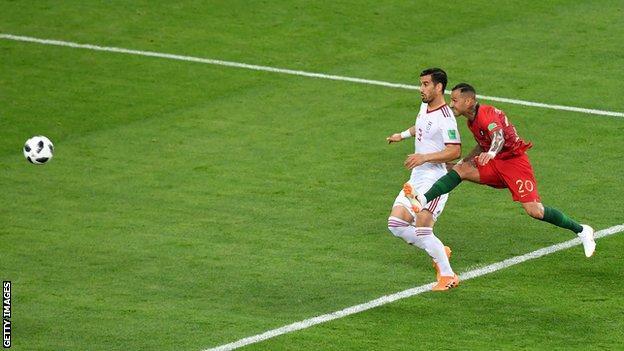 Iran’s goal – scored after 92 minutes and 48 seconds – was the latest goal Portugal have ever conceded at the World Cup. Portugal have never lost a World Cup match when they’ve scored first (W13 D3).